The two newspapers serving Congressional District 23 and aimed specifically at African Americans have both endorsed Nova University law professor Tim Canova over incumbent Rep. Debbie Wasserman Schultz. It represents a first for Wasserman Schultz. Failing to win the support of all newspapers in her district has never happened to the former Democratic National Committee chair before. 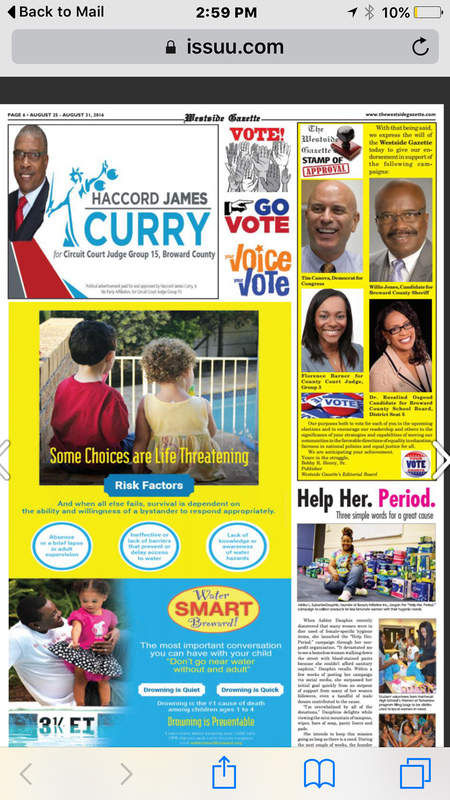 The Westside Gazette ran its Canova endorsement for the U.S. House seat in a page of snapshots (see the display below); The Miami Times in a more traditional editorial-page format. "Newcomer Tim Canova ... has made inroads with voters, saying that he has fresh ideas and would pay more attention to the eastern part of the district," Miami Times editors wrote. "She is supported by the Congressional Black Caucus and numerous other Democratic organizations. But residents in Hollywood, Dania Beach and surrounding areas say that Wasserman Schultz ignores their needs. ..."
In fact, she is supported by President Obama and Hillary Clinton, too -- the Democratic leaders some claim have used their endorsement as a way to say "thank you" while at the same time nudging her off the DNC chair. Wasserman Schultz resigned her chair under duress at the party's national convention in Philadelphia, primarily for taking sides with Hillary Clinton over Bernie Sanders. Since spring, Sanders has openly and generously supported progressive candidate Canova's campaign. Apart from mounting accusations of favoritism, Wasserman Schultz was increasingly out of step with the policy positions of most members of the Democratic Party when it came to issues like medical marijuana, TPP, the Iran deal, and Cuban relations. More important from the party perspective, she failed at the one task that was supposed to be the focus of her job as DNC chair: getting Democrats elected to office. Under her leadership, the Democratic Party lost an estimated 11 governorships, 13 U.S. Senate seats, 69 House seats, and 913 state legislative seats -- plus 30 state legislative chambers. Said the Times editorial, "Just as the DNC has new leadership, we believe the district deserves new leadership, too." Canova, like the Times, knows he has an uphill battle in the district. Wasserman Schultz is capitalizing on a stranglehold she's had on the area since she first represented it in Congress more than a decade ago. She’s the first Jewish congresswoman from Florida in a district that skews white, Democratic and Jewish. And she's famous for her constituent services among the "condo crowd" that dominates CD 23. One South Florida political consultant told Sunshine State News, "As far as I can tell, one-half of her constituents haven't got a clue about Debbie's antics as DNC chair, and the half who know don't care. They plain like her and they're going to vote for her." But Leslie Wimes, founder and president of the Democratic African American Women's Caucus, said the newspapers' endorsements prove not all eligible voters in the district are Wasserman Schultz's condo commandos. And she shouldn't count on victory Aug. 30. "It's unfortunate that Debbie Wasserman Schultz and others like her feel that, rather than actually engaging with the black community, all she has to do is present other black people to secure our votes. "We need representatives who are going to be accessible and present all the time, not just at election time," Wimes said. "That is not Debbie Wasserman Schultz. I'm glad The Westside Gazette and The Miami Times recognize that. I hope the voters will as well and vote for Tim Canova." Just get out and vote. Elect new brand rep..
"Ignores heir needs"? She downright threw the Jews under the bus with her support for that Iran deal. Why not the blacks? Just makes one wonder exactly what it takes to finally "open voters eyes" to the fact that their election choices are disinterested morons who don't give a damn about their constituents,...except as a means to their OWN self-serving ambitions. It's also an amazing revelation as to just how long it takes to "remove the scales" from those voters eyes (In "Debbie Do Nothing's" case almost 12 long, painful years). NOW, if only the voters in Districts 2; 5; 9; 14; 16; 18; 20; 22; 24; 26; and 27 "wake up" and realize that they ALSO are represented by self-serving, "tell you ONLY what you want to hear platitudes", and "play you like a violin" pettifoggers whose primary concerns are the Congressional cafeteria, barber shop, hair dresser, and Lobbiest's phone numbers to arrange for 'evening dinner & entertainment'. The latest "sage of enlightenment" to "come down the pike" to inform some voter factions seems to be Leslie Wimes (Would that she remains objective and true...and others "pick up her gauntlet" challenging the Representative status quo). Proves the bias of the Corporate Media [Sun Sentinel & Miami Herald} hacks and negates the tepid endorsement by President Obama. People in her district should be ashamed to vote for a candidate that refuses to debate her opponent Tim Canova in prime time television. He has taken no corporate or super-pac money and has raised the most from small donations of any Congressional candidate. He has a very progressive agenda and is in the best position to vote for his constituents. Please see Tim Canova for Congress.org or visit his facebook page. Watch the debate online and then decided who is the better candidate. Thank you for the article.